It is not the best of times for Mamata Banerjee. On May 23, the West Bengal chief minister went to Bengaluru to attend the swearing-in of Janata Dal (Secular) leader H.D. Kumaraswamy as Karnataka chief minister. Unlike other VIP invitees, she was forced to get out of her car and walk for 20 minutes to reach the venue, as her convoy was held up because of a mix-up in traffic arrangements. She was later seen venting her anger at Neelamani Raju, Karnataka’s director-general of police, and complaining to Kumaraswamy and his father, JD(S) national president H.D. Deve Gowda. Mamata’s party colleagues say she is now increasingly angry and impatient. She has good reason: With the Lok Sabha elections barely a year away, her Trinamool Congress is facing tough competition from the BJP in West Bengal. Trinamool leaders fear that if Narendra Modi returns as prime minister in 2019, he would go all out to defeat Mamata in the 2021 assembly elections. 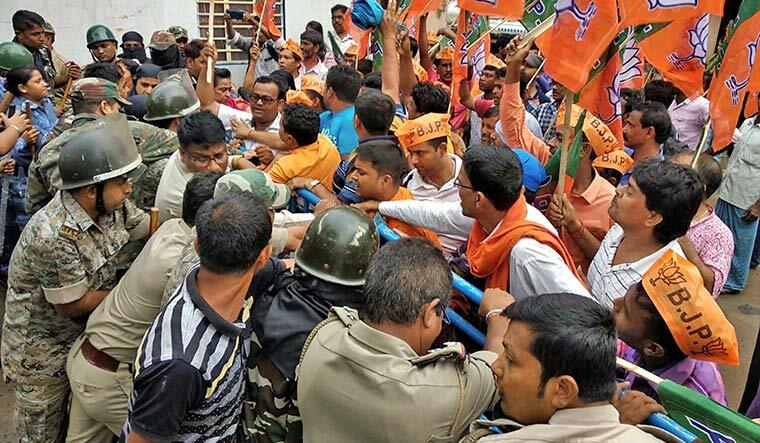 The BJP alleges that the Trinamool “rigged” the recent panchayat elections to win around 17,000 seats (around 35 per cent of the total seats) without contest. The BJP won more than 6,000 seats that had gone to the polls, and became the primary opposition party. In Junglemahal, a region that borders Jharkhand, the BJP even overtook the ruling party, winning around 50 per cent of seats. Though the BJP still trails the Trinamool by a considerable margin, Mamata is losing sleep over the saffron party’s massive surge in vote share. In Purulia district, which is part of Junglemahal, the BJP won 73 of 92 gram panchayats, 17 of 20 panchayat samitis, and all two zilla parishad seats. It seems the tribals are moving away from the Trinamool—a trend that could have serious repercussions for the party in the tribal-dominated North Bengal as well. Sensing the danger, Mamata sent her nephew Abhishek Banerjee, MP, to Junglemahal soon after the results were out. Banerjee is said to have made an inflammatory speech in Balrampur in Purulia, a day after which the body of an 18-year-old BJP worker called Trilochan Mahato was found hanging from a tree in his village. Three days later, Dulal Kumar, a BJP worker who was in his twenties, was found in a similar manner. The BJP alleged that both of them were killed by Trinamool members. The deaths sent shockwaves across the state and put Mamata under immense pressure. So much so that she removed three cabinet ministers in whose areas the BJP did well in the elections. They have been asked to concentrate on organisational work ahead of the Lok Sabha elections. The state’s volatile politics and the manner in which the elections were held have also attracted the attention of the Supreme Court. While admitting separate petitions filed by opposition parties, the court expressed “surprise” at the rise in the number of uncontested seats in the civic polls. Mamata has been making swift political moves to counter the BJP’s growing influence in West Bengal. After the Karnataka results were announced, she was among the first to congratulate Gowda and Kumaraswamy. Sources said Mamata had called up Congress leader Sonia Gandhi and advised her to support the JD(S) to keep the BJP out of power. Mamata also got in touch with other regional leaders and Kumaraswamy’s swearing-in saw an unlikely display of bonhomie among politicians opposing the BJP. Mamata spoke to Sitaram Yechury, general secretary of the CPI(M), the Trinamool’s bête noire in Bengal. Yechury later said in Kolkata that he was just being courteous. Though Mamata avoided interacting with Congress president Rahul Gandhi, she and Sonia were seen sharing a laugh. Apparently, Mamata’s target is to stitch up and lead a rainbow coalition that would be able to win around 200 seats, thereby forcing the Congress to extend support like it did in Karnataka. Perhaps, understanding this, the BJP is already trying to discredit Mamata. In his speech to BJP workers in Delhi soon after the Karnataka verdict, Prime Minister Narendra Modi drew attention to the political violence in West Bengal. “I think the civil society, the people of Bengal and the judiciary would have to find a solution to what is happening there,” he said. Mamata would not want the Supreme Court to follow the prime minister’s cue to step in. The court has posted the hearing on petitions filed by opposition parties to July 3. If it makes any observation supporting the petitioners’ contention that there is a “collapse of the democratic set-up in Bengal”, it would enable the Union government to take steps to implement Article 356 in the state—which allows for president’s rule. “The BJP in West Bengal has asked the BJP at the Centre to press for the imposition of Article 356 in the state,” said Biswapriya Roychowdhury, vice president of the BJP’s state unit. The CPI(M), however, does not support president’s rule. “Imposing Article 356 or 355 would not be to cure the system, but to allow the BJP to grow in a massive way in Bengal,” said CPI(M) leader Sujan Chakraborty. “We cannot let violence and demolition of constitutional bodies continue under a different banner.” Chakraborty, however, admitted that the CPI(M) may be forced to change its stand “if the situation worsens”.